Joshua Abraham Norton (February 4, 1818 - January 8, 1880) declared himself "Norton I, Emperor of the United States" in 1859. He later added the title "Protector of Mexico." Instead of being persecuted for his audacious claims, he was celebrated by the citizens of his home city of San Francisco, California, and memorialized in the literature of prominent authors. Joshua Norton's parents were English Jews who first left England to move to South Africa in 1820 as part of a government colonization scheme. They were part of a group that came to be known as the "1820 Settlers." Norton's birthdate is in some dispute, but February 4, 1818, is the best determination based on ship records and the celebration of his birthday in San Francisco. Norton emigrated to the United States somewhere around the 1849 Gold Rush in California. He entered the real estate market in San Francisco, and by 1852 he was counted as one of the wealthy, respected citizens of the city. In December 1852, China responded to a famine by placing a ban on export of rice to other countries. It caused the price of rice in San Francisco to skyrocket. After hearing of a ship returning to California from Peru carrying 200,000 lbs. of rice, Joshua Norton attempted to corner the rice market. Shortly after he purchased the entire shipment, several other ships from Peru arrived filled with rice and the prices plummeted. Four years of litigation followed until the Supreme Court of California eventually ruled against Norton. He filed for bankruptcy in 1858. "At the peremptory request and desire of a large majority of the citizens of these United States, I, Joshua Norton, formerly of Algoa Bay, Cape of Good Hope, and now for the last 9 years and 10 months past of S. F., Cal., declare and proclaim myself Emperor of these U. S.; and in virtue of the authority thereby in me vested, do hereby order and direct the representatives of the different States of the Union to assemble in Musical Hall, of this city, on the 1st day of Feb. next, then and there to make such alterations in the existing laws of the Union as may ameliorate the evils under which the country is laboring, and thereby cause confidence to exist, both at home and abroad, in our stability and integrity." 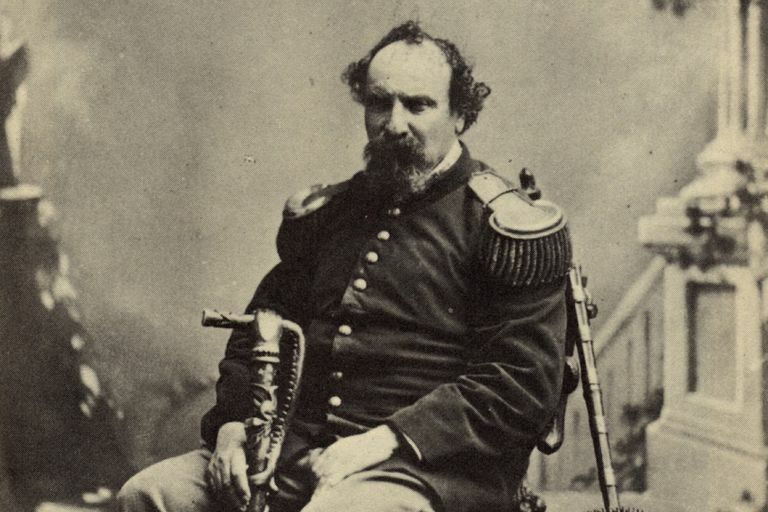 Emperor Norton's multiple decrees about the dissolution of the U.S. Congress, the country itself, and abolishment of the two main political parties were ignored by the federal government and the generals leading the U.S. Army. However, he was embraced by the citizens of San Francisco. He spent most of his days walking the city's streets in a blue uniform with gold epaulets that was given to him by the U.S. Army officers based at the Presidio in San Francisco. He also wore a hat festooned with a peacock feather. He inspected the condition of roads, sidewalks, and other public property. On many occasions, he spoke on a wide range of philosophical topics. Two dogs, named Bummer and Lazarus, that reportedly accompanied his touring of the city became celebrities as well. Emperor Norton added "Protector of Mexico" to his title after the French invaded Mexico in 1861. In 1867, a policeman arrested Joshua Norton to commit him to treatment for a mental disorder. Local citizens and newspapers expressed extreme outrage. The San Francisco police chief Patrick Crowley ordered Norton released and issued a formal apology from the police force. The emperor granted a pardon to the policeman who arrested him. Although he remained impoverished, Norton frequently ate for free in the city's best restaurants. Seats were reserved for him at the openings of plays and concerts. He issued his own currency to pay his debts, and the notes were accepted in San Francisco as local currency. Photos of the emperor in his regal costume were sold to tourists, and Emperor Norton dolls were manufactured, too. In turn, he demonstrated his love for the city by declaring that using the word "Frisco" to refer to the city was a high misdemeanor punishable by a $25 fine. October 12, 1859: Formally abolished the U.S. Congress. December 2, 1859: Declared that Governor Henry Wise of Virginia should leave the office for the execution of abolitionist John Brown and John C. Breckinridge of Kentucky inaugurated in his place. July 16, 1860: Dissolved the United States of America. August 12, 1869: Dissolved and abolished the Democratic and Republican parties because of party strife. March 23, 1872: Ordered that a suspension bridge be built as soon as possible from Oakland Point to Goat Island and on to San Francisco. September 21, 1872: Ordered a survey to determine whether a bridge or a tunnel was the best way to connect Oakland and San Francisco. Of course, Joshua Norton did not yield any actual power to enforce these acts, so none were carried out. On January 8, 1880, Joshua Norton collapsed on the corner of California and Dupont Streets. The latter is now named Grant Avenue. He was on his way to attend a lecture at the California Academy of Sciences. Police immediately sent for a carriage to take him to the City Receiving Hospital. However, he died before a carriage could arrive. A search of Norton's boarding house room after his death confirmed that he was living in poverty. He had approximately five dollars on his person when he collapsed and a gold sovereign worth approximately $2.50 was found in his room. Among his personal items were a collection of walking sticks, multiple hats and caps, and letters written to Queen Victoria of England. The first funeral arrangements planned to bury Emperor Norton I in a pauper's coffin. However, the Pacific Club, a San Francisco businessman's association, elected to pay for a rosewood casket befitting a dignified gentleman. The funeral procession on January 10, 1880, was attended by as many as 30,000 of San Francisco's 230,000 residents. The procession itself was two miles long. Norton was buried in the Masonic Cemetery. In 1934, his casket was transferred, along with all other graves in the city, to Woodlawn Cemetery in Colma, California. Approximately 60,000 people attended the new internment. Flags across the city flew at half mast and the inscription on the new tombstone read, "Norton I, Emperor of the United States and Protector of Mexico." Although many of Emperor Norton's proclamations were considered to be nonsensical ravings, his words about the construction of a bridge and subway to connect Oakland and San Francisco now appear prescient. The San Francisco-Oakland Bay Bridge was completed on November 12, 1936. In 1969 the Transbay Tube was completed to host the Bay Area Rapid Transit's subway service connecting the cities. It opened in 1974. An ongoing effort titled the "Emperor's Bridge Campaign" has been launched to have Joshua Norton's name attached to the Bay Bridge. The group is also involved in efforts to research and document Norton's life to help preserve his memory. Joshua Norton was immortalized in a wide range of popular literature. He inspired the character of "the King" in Mark Twain's novel "The Adventures of Huckleberry Finn." Mark Twain lived in San Francisco during part of Emperor Norton's reign. Robert Louis Stevenson's novel "The Wrecker," published in 1892, includes Emperor Norton as a character. The book was co-written with Stevenson's stepson Lloyd Osbourne. It is the story of the solution of a mystery surrounding a wreck at the Pacific Ocean island Midway. Norton is considered to be a primary inspiration behind the 1914 novel "The Emperor of Portugallia" written by Swedish Nobel laureate Selma Lagerlof. It tells the story of a man who falls into a dream world where his daughter has become an empress of an imaginary nation, and he is the emperor. In recent years, the memory of Emperor Norton has been kept alive throughout popular culture. He has been a subject of operas by Henry Mollicone and John S. Bowman as well as Jerome Rosen and James Schevill. American composer Gino Robair also wrote an opera "I, Norton" which has been performed in both North America and Europe since 2003. Kim Ohanneson and Marty Axelrod wrote "Emperor Norton: A New Musical" that ran for three months in 2005 in San Francisco. An episode of the classic TV western "Bonanza" told much of the story of Emperor Norton in 1966. The episode centers on an attempt to have Joshua Norton committed to a mental institution. Mark Twain makes an appearance to testify on Norton's behalf. The shows "Death Valley Days" and "Broken Arrow" also featured Emperor Norton. Joshua Norton is even included in video games. The "Neuromancer" game, based on the novel by William Gibson, includes Emperor Norton as a character. The popular historical game "Civilization VI" includes Norton as an alternate leader for the American civilization. The game "Crusader Kings II" includes Norton I as a former ruler of the Empire of California. Drury, William. Norton I, Emperor of the United States. Dodd, Mead, 1986.